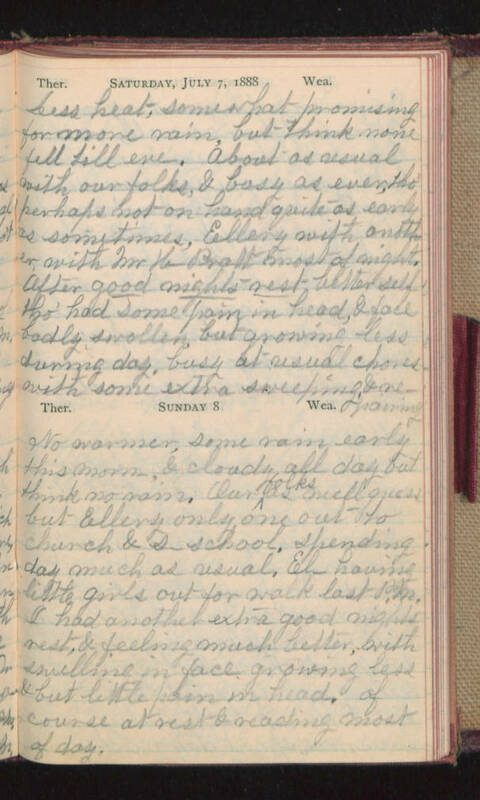 Saturday, July 7, 1888 less heat, somewhat promising for more rain, but think none fell till eve. About as usual with our folks, & busy as ever, tho' perhaps not on hand quite as early as sometimes, Ellery with another, with Mr K- Pratt most of night. After good nights rest better self tho' had some pain in head, & fact badly swollen, but growing less during day, busy at usual chores with some extra sweeping, & repairing. Sunday 8 No warmer, some rain early this morn, & cloudy all day but think no rain. Our folks as well guess but Ellery only one out to church & s-school, spending day much as usual.. El- having little girls out for walk last P.M. I had another extra good nights rest, & feeling much better, with swelling in face growing less & but little pain in head, of course at rest reading most of day.